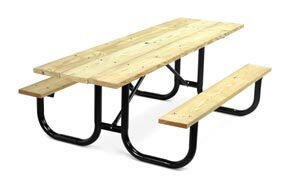 High quality picnic tables that are built to last. 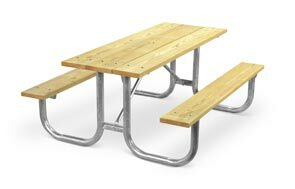 These wood or aluminum plank Park Master picnic tables are the best in the parks and recreation industry. The pre-drilled wood planks are available in Untreated, Redwood Stained or MCA Pressure Treated southern yellow pine. Frames are constructed with 2-3/8" O.D. steel tubing that can be powder-coated black or hot dip galvanized after fabrication. 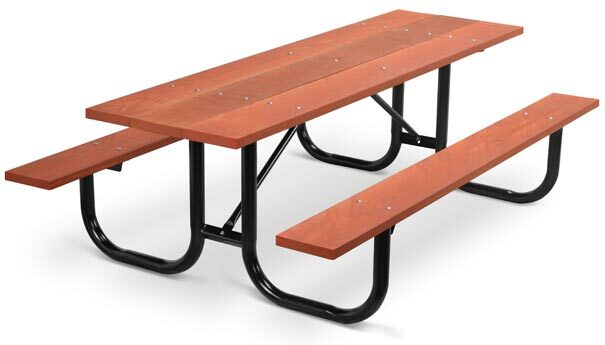 The frame design offers easy slide in seating for all age groups. Table frame is fully welded for extra rigidity and maximum vandal resistance.